Surrey County Council has submitted a planning application to build a primary school on the recreation ground at Battlebridge Lane. The site is the field to the north of the lane (next to the field with the athletics ground and football pitch). 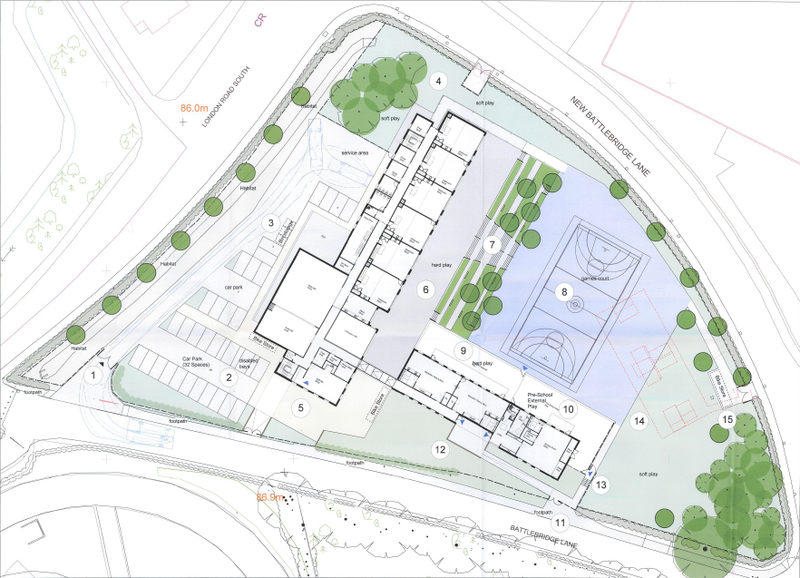 The application is for: erection of new two storey 2 form entry primary school (420 places) and nursery (26 FTE places) together with provision of 29 parking spaces, 3 disabled user parking spaces, 8 staff cycle spaces, 62 cycle/scooter spaces for pupils; access off Battlebridge Lane; laying out of outdoor hard and soft play areas and landscaping. This has been expected for a long time – at last we have a chance to study the plans in detail and give our views to the planners. You can also see the plans at the Town Hall. If you’d like to do this, telephone the Planning Department on 01737 276772 between 9am and 2pm Monday to Friday to make an appointment so that someone will be on hand to help you. This application will be determined by Surrey County Council so it is important to send your views to them. Make sure to include the reference number SCC REF 2013/0166/DH and your name and address. Reigate and Banstead Borough Council is a consultee, please copy your views to them too, quoting their reference no 13/01841/CON. Why this Green Belt site? Your councillors will read the documents carefully. We are particularly interested to find out how and why this site was selected. The site has obvious disadvantages, including its small size, position at a busy junction on the A23, and the need to share playing fields with the public. Also, it is in the last remaining patch of Green Belt separating Redhill and Merstham, where the Green Belt is at its very thinnest. Surrey needs to prove that there are “very special circumstances” before it can approve a new school on Green Belt. We are curious to see how it will do this, especially when Surrey County Council owns the very large and under-used St Nicholas School site nearby, which could easily accommodate the new primary school as well as the existing special school and the future secondary school that’s been talked about. Until now, despite repeated enquiries, including under Freedom of Information regulations,we have not been able to find out anything about how potential sites were assessed or this one chosen. We hope that the application documents just submitted will contain the answers to these questions. ‘The business case for the Merstham primary school’ was to have been discussed at the Surrey County Council Cabinet meeting on 22 October. However it has now disappeared from the agenda. If the business case is purely about the need for a new primary school in the North Redhill area, it is hard to imagine anyone disagreeing. There is an acute shortage of primary school places here, made a lot worse by the building of 1,000 new homes in Water Colour and Park 25 in the last decade. All the same, it seems odd that planners are being asked to decide on the school before the business case has been agreed. The plans are out for consultation until 1 November (for Reigate & Banstead) and 11 November (Surrey). Surrey County Council Planning Committee will decide whether or not to approve the application at their meeting on 11 December 2013.